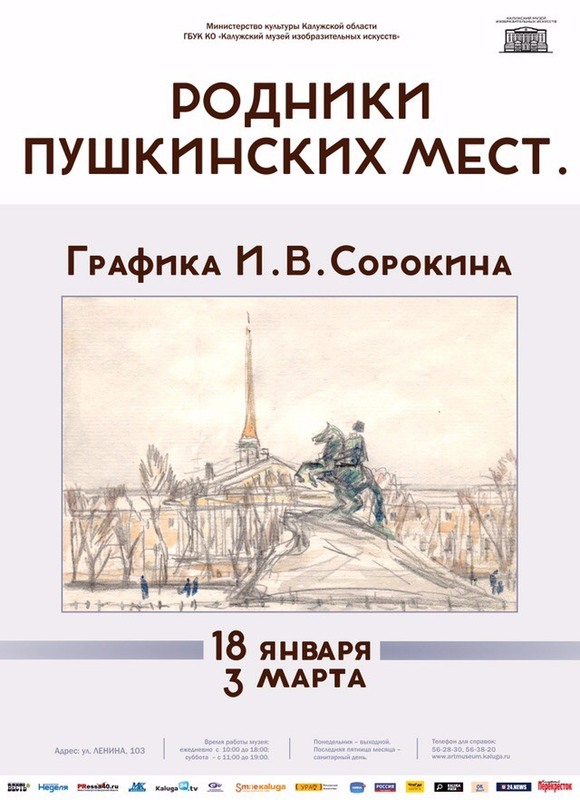 January 18, 2019 at 16-00 in the Kaluga Museum of Fine Arts (103, Lenin St., IOWTS, second floor) will open the exhibition of the works of Moscow artist Ivan Vasilyevich Sorokin "Springs of Pushkin places" from the collection of I.N. Khotyn. Ivan Vasilievich Sorokin (1922-2004) - a recognized domestic master, representative of the Moscow school of painting, academician of the Russian Academy of Arts, laureate of the RSFSR State Prize named after I. Ye. Repin, People’s Artist of the RSFSR. Ivan Sorokin made his first steps in art at the famous secondary art school on Kalyaevskaya Street with a teacher V. V. Pochitalov, whose students were such significant Russian painters as Helium Korzhev, Vladimir Stozharov, Efrem Zverkov, Viktor Ivanov, Valentin Sidorov and others. In the summer of 1942, Sorokin was drafted into the army, but two years later he was recalled from the front to the Studio of Military Artists named after M. Grekov. After the war, the master studied at the Moscow State Art Institute (now - Moscow State Academic Art Institute named after V.I. Surikov) in the workshop of S.V. Gerasimov, thanks to which the immaculate taste and artistic skill of Ivan Sorokin were formed. Great interest in the work and personality of Alexander Sergeevich Pushkin resulted in the creation of a series of works on “By Pushkin Places”, for which in 1988 the artist received a silver medal of the USSR Academy of Arts, in 1999 - a gold medal, and later he was invited to participate in numerous exhibitions, dedicated to the 200th anniversary of the poet. The exhibition of works by Ivan Sorokin “Springs of Pushkin Places” includes sketches and sketches with views of St. Petersburg and its environs, Mikhailovsky, Boldin and other localities connected with the life of A. Pushkin. Sorokin confessed to Yuri Bychkov, his biographer: “When I became better acquainted with Pushkin, my love for all my relatives became deeper. Each line of the poet for me - a call to work. It is necessary to say: “Already the sky breathed in the fall”, - I am painting, I feel paint. ” The compositions presented at the exhibition are made with lead pencil, felt-tip pens, watercolor, oil and demonstrate the high level of the artist’s skill. The artist creates a lot of watercolor sketches: light, separate, saturated strokes cover the paper with transparent color, shining like fragments of glass in a stained-glass window. For the seeming ease of execution lies a systematic purposeful work of the author, masterly mastery of a spatial living line, expressive imagery of interpretation. Creativity Ivan Vasilyevich Sorokin occupies an important place in the domestic art of the twentieth century. The artist’s works are in the collections of the State Tretyakov Gallery, the Russian Museum, as well as in private and museum collections in Russia and the world. The exhibition will run until March 3, 2019.